What is health information technology? Find out and win a $25 gift card! 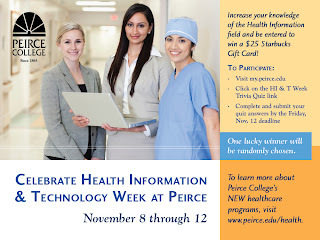 Did you know that Peirce recently introduced new healthcare degree programs? To help you better understand the degree offerings and how they can translate into opportunities in this growing field of healthcare careers, we are celebrating Health Information and Technology Week from Nov. 8-12. HI&T week is a national recognition week sponsored by the American Health Information Management Association (AHIMA) to recognize the achievements of healthcare professionals. To commemorate the week, we put together a quick trivia quiz that will familiarize you with the Health Information field. Visit my.peirce.edu and click on the HI&T Week Trivia Quiz link to take the quiz by Friday, Nov. 12, and you’ll automatically be entered into a raffle to win a $25 Starbucks Gift Card! And remember, I’m here to answer your questions and tell you more about what a degree in health information technology can do for your career.